LW025GCA Full size dreadnought, Spruce top, Nato back and sides, bound, gloss, cutaway, Nato set neck, Rosewood fretboard & bridge, 20 frets, chrome Grover gears. 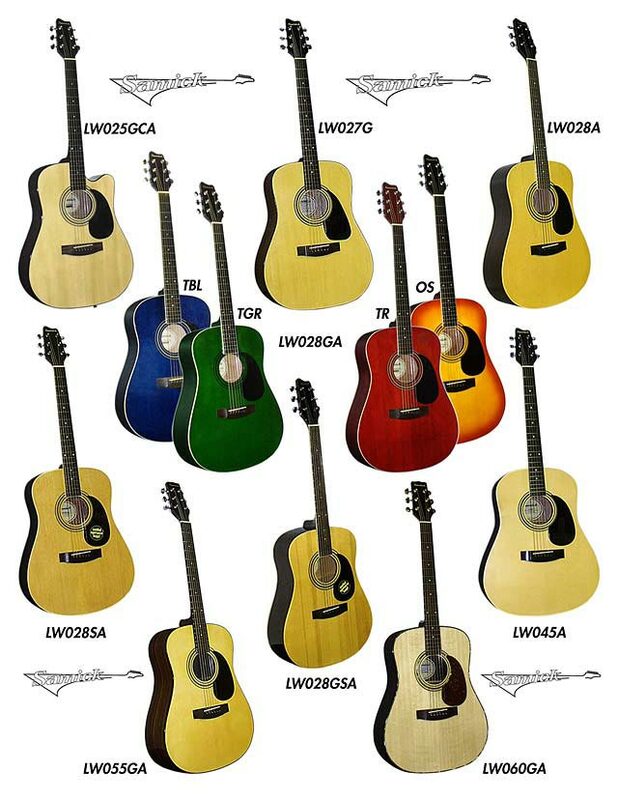 LW027G Full size dreadnought, Spruce top, Ovangkohl back & sides, bound, Nato set neck, Rosewood fretboard & bridge, 20 frets, chrome die-cast gears, gloss finish. LW028A Full size dreadnought, Spruce top, Nato back & sides, ivory bound, bound Nato set neck, Rosewood fretboard & bridge, 20 frets, Grover gears, satin finish. LW028 SA Full size dreadnought, Solid Spruce top, Nato back & sides, ivory bound, bound Nato set neck, Rosewood fretboard & bridge, 20 frets, chrome die-cast gears, satin finish. LW028 GSA Full size dreadnought, Solid Spruce top, Nato back & sides, ivory bound, bound Nato set neck, Rosewood fretboard & bridge, 20 frets, Grover gears, gloss finish. LW045A Vintage slope sholder dreadnought, Spruce top, Nato back & sides, Rosewood FB, 20 frets, chrome Grover gears, ivory binding, satin finish. LW055GA Full size dreadnought, Spruce top, Rosewood back and sides, bound, Nato set neck, Rosewood fretboard & bridge, 20 frets, chrome Grover gears, gloss finish. LW060GA Full size dreadnought, Spruce top, Rosewood back & sides, Abalone inlya, Mahogany set neck, Rosewoo retod&rdge, 20 frets, chrome Grover gears, gloss finish.